Actress Shannen Doherty is grateful to be in remission after battling breast cancer. “Extra” was with Shannen and her good friend Marc Ching at an Animal Hope and Wellness Foundation event focused on putting an end to dog abuse. To learn more, visit AnimalHopeandWellness.org. 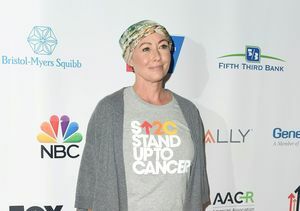 Tough Shannen Doherty Works Out Even After Chemo!